--Congratulations on completing the "STEREO WORXXX" album! What kind of album was this for you? 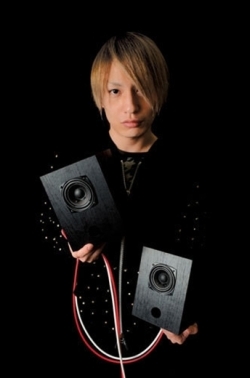 Nakata: I was very particular about making sure that it was full of the pleasure of music and an atmosphere of ringing sound. Capsule is a unit that puts out music with the utmost honesty. There are a lot of elements to the production that you wouldn't think about if they weren't there. --Speaking of which, you work on mass productions like the music and vocals for Perfume and Kyary Pamyu Pamyu, the "ONE PIECE Ten" event and the "LIAR GAME -Saisei-" soundtrack. --The melodious keyboard phrases of the first track, "Feelin' Alright," are impressive. It felt like you were going for a rock fusion with this song. Were you aware of that image? N: That's the result of doing a lot of different things during production. Capsule isn't a unit where I'm doing production on a vocalist. You called it "fusion," but when you imagine Koshijima [Toshiko] and I on stage putting together phrases between her voice and my synthesizer, that music is us fighting while also moving forward. If you look at us like a band, Koshijima has a solo instrument and I'm the band master. And the vocals are the speaker. That's the atmosphere. When our two sounds come out of the speakers, that's capsule. --When you say it that way, it's really easy to understand. That's the essence of capsule. N: In my case I lead the sound. I have the most power in recording. Because of that, I'm honing my skills, knowledge, and senses everyday. It feels closer to being a manga artist than a musician, if you know what I mean. I don't think I'm the leader - the work itself leads the way, like it leads a manga artist. --Oh, that makes it really easy to understand. It's work-centric. N: When I'm in the studio, it's like I'm in my atelier. When the work produced there is able to show me the way, and people appreciate that work, that makes me the happiest. --When you're able to lock yourself away in your atelier, aren't you able to complete all your mixing at once? How do you know it's done? N: I have a deadline. (laugh) It's probably the same way for the manga artist. --Ah, do you struggle with your deadlines? N: I do struggle with them at the very end. When I've passed my time, there's a moment when I break past the quality wall. After that it's more about change than evolution, more about figuring out the feeling. --Your fans, including myself, are very interested in your process, but you don't seem interested in showing or telling us about it. N: That's almost true, but I feel I've struck a deal with fans by showing it [on stage]. I probably wouldn't even do lives if I didn't get requests. But there's an audience that wants to see Koshijima sing it. --That's a simple answer. Speaking of which, I like the last song on the album, "Transparent," an intelligent "pop of the moment" song that draws a picture of the pop music from five years ago. The catharsis of the undulating melody is irresistible. N: At first I wanted to do an album of nothing but songs like this one. This song seems like it would be hard to copy by ear. Even I thought I was doing something interesting. But it was hard to find it's place in the album, and it eventually became the 9th and final song. I'm not saying that I want to do mainly this kind of music in the future, but I think I would have made the album more "Japanese" if I'd been able to extend the deadline by two months and focus only on "Transparent." -- Speaking of which, are there any albums or other works that you were influenced by while making "STEREO WORXXX?" N: I want to be influenced by all kinds of things. What I mean to say is, even Kyary (Pamyu Pamyu) influences me. I offer up the kinds of lyrics that I've been wanting to try out. It's not that I want to try everything; the people, places, and timing that I'm working with are important. --Kyary Pamyu Pamyu occupies an interesting place in the Japanese and world pop culture scenes right now. What place do you think that is? N: When Kyary debuted, the grown-up, business reaction was to worry if a long, weird name like Kyary Pamyu Pamyu was really a good idea. I mean, there are people who say "Let's give it an easier to pronounce, easier to remember name with cooler characters* and sell it to the people who are into Harajuku fashion!" But I think that's a really bad idea. It's already been done, so it's boring. So her weird sense is appealing. Because no one else has it. The process that those kinds of people follow is fun. In that way, Kyary is a true punk. --That's true. I'm very interested in Kyary's success story. Now, I just have to ask, because it's you: what are your thoughts people's tendency to listen to music on their personal hardware? N: I think we've regressed to a place where it's common to hear music on smart phones and cell phones. People don't go out of their way to listen to music; instead, the music just "pops in." --Because of online music distribution, like ChakuUta. N: But I think how we enjoy it is evolving. Online music distribution is going to the cloud, and even though that doesn't always replace a CD, we're in a world where people really enjoy music. I'm not hung up on the hardware. Music is an individual taste, and I think you should listen to what you think is easy to listen to. People are renewed by different things, so it's better for them to listen to what fulfills them. --I see. So everyone doesn't need a high-priced analog player. N: But as a professional musician, I want to make music where I fuss over every little sound. The music that would result if I stopped would be just like everyone else's, so I don't want to do that. So with "STEREO WORXXX" I fussed over everything, including the title. So we can't just decrease the amount of music people want to hear over great speakers. *Presumably English characters, since Kyrary Pamyu Pamyu is spelled with Japanese characters in Japan.